Simulations reveal a poetic side to our inner atoms. I guess we’re all intergalactic immigrants. Image credits: Spitzer / NASA. Even the size of the Earth can be hard to fathom. Nowadays, it can be so easy to get from place to place by driving or flying that our sense of distance gets distorted. But let’s translate things into something more familiar. If you could magically walk on water, it would take 140 days of heavy walking to pass the almost 6,000 km from New York to London. You might think that’s incredibly far, but when it comes to outer space, that’s just peanuts. The Moon, our satellite, is 384.400 km away from the Earth. We got to the Moon in 1969, but to this day, we haven’t been able to plan a mission to Mars — which is much farther away. If you think that’s far, just consider how big the solar system is: the distance between the Sun and Neptune is 4.49 billion km. Then, let’s consider the next solar system, which is 4.22 light years away — a whopping 40,000 billion kilometers away from Earth. Are you getting the sense of scale? We’re not done yet. There are an estimated 100 billion solar systems in our galaxy, with comparable distances between them. The immensity of the galaxy truly is humbling, and the distance between galaxies? That’s at over 11 million light years, and I just don’t want to put that in kilometers. You might wonder why we did all that contorted imagination exercise. Well, we went from a very large but conceivable distance (New York to London) to an unfathomable distance outside our galaxy. Everything outside our galaxy is so far away that seems like it couldn’t possibly affect us. Except, as scientists learned, half of the matter in our own galaxy comes from outside. Carl Sagan famously said we are made of star stuff, and his words ring truer today more than ever. According to modern physics, the first atomic nuclei were formed three minutes after the Big Bang — before that, things were just too hot for the atoms to be stable. This is the so-called nucleosynthesis era. But at that time, only hydrogen, helium, and some trace quantities of lithium were formed, so where does all the other stuff come from? Well, things like carbon, oxygen, or heavier elements such as gold and silver, were formed in the primordial supernovae: incredibly huge and relatively short-lived stars. These supernovae exploded with such incredible power that they scattered matter all over the universe. Faucher-Giguère and his co-author Daniel Anglés-Alcázar wanted to see to what extent is matter in the Milky Way a far traveler. They found that matter travel has been greatly underrated. 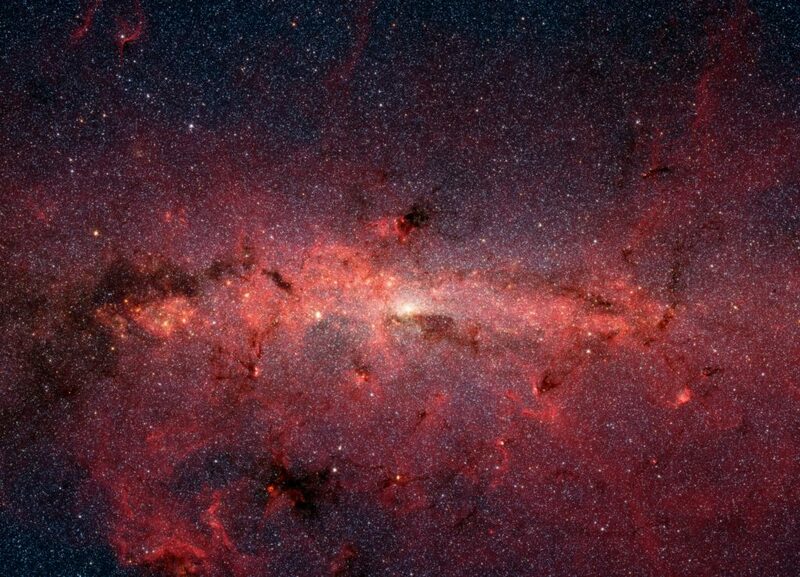 In a report in the Monthly Notices of the Royal Astronomical Society, they write that the Milky Way absorbs about one sun’s worth of extragalactic material every year, and that half of the matter inside the galaxy was actually “imported.” In a way, we’re all intergalactic travelers. Aside from the romantic aspect, the study also offers an important scientific perspective. Knowing where matter comes from and how it evolves is one of the cornerstones of modern cosmology.